A popular vacation spot, Montego Bay is Jamaica's welcome mat with Sangster International Airport (MBJ) as its front door. Famous for its great beaches, local shops, clubs, restaurants and bars, Montego Bay is hot, hot, hot for travelers looking for authentic island adventure. Upon exiting the Customs hall, you’ll proceed to the Sandals Lounge, which is conveniently located at Sangster International Airport. Your complimentary transfer to and from the resort will be arranged by Sandals. Climb aboard your bus and enjoy your included roundtrip airport transfer from Sangster International Airport to Sandals Montego Bay. The ride takes less than 10 minutes. The beaches in Jamaica are truly spectacular, from secluded private coves to Negril's world-renowned seven-mile stretch of powdery white sand, all looking out onto the ultra-clear, turquoise waters of the Caribbean. So a couple could be forgiven for spending their entire heavenly Sandals vacation basking in the seductive warmth of the ever-present sunshine, while sipping exotic tropical drinks and gazing out at the endless expanse of aquamarine sea. But, truly, Sandals in Jamaica is so much more than just a beach, it's the perfect couples only resort. Stroll Montego Bay's Gloucester Road and get a sense of Jamaica's vibrant present as well as a picture of her colonial past. With quaint gingerbread architecture merging seamlessly with more modern structures, Montego Bay, Jamaica's second-largest city, allows visitors to dive into the heart of a bustling, Caribbean town. Pause to marvel at the Georgian buildings or linger the afternoon away in a crafts market. Vivid colors, activity and laughter abound everywhere you turn in Montego Bay inviting you to soak in the warmth and join in the fun. Welcomed by the cool sea breeze, the moment you walk into the open-air lobby you know that you have arrived at the perfect vacation paradise. Set along Jamaica's longest private white-sand beach, Sandals Montego Bay offers guests an authentic laid-back Caribbean experience and the lively vibe of the islands. Here, the blues are as far as the eye can see and the fun never ends. With eight world-class restaurants, chic oceanfront pools, tropical gardens, and Bay Roc Villas – with butler service – just steps from the sea, Sandals Montego Bay is the most vibrant resort in Jamaica. If you're looking for a lively, fun-filled vacation on Jamaica's largest private white-sand beach, where the party never stops until you do, Sandals Montego Bay is for you. Sandals Montego Bay also features glamorous sophistication at a secluded on-the-beach enclave known as Bay Roc Estate Beachfront Villa Suites. · Boasts the largest private white sand beach on the North Coast of Jamaica. Full exchange privileges, with complimentary transfers to Sandals Royal Caribbean and Sandals Carlyle, our sister resorts. Enjoy all the luxuries included in our “stay at one, play at three” concept offering 18 dining options within ten minutes (8 at Sandals Montego Bay, 7 at Sandals Royal Caribbean and 3 at Sandals Carlyle). 250 Rooms and Suites in 19 categories spread over 26 acres. · Exclusive to Sandals Montego Bay is a beautiful, non-denominational Chapel located on the resort. 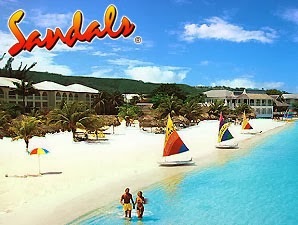 Sandals' exclusive exchange program lets you stay at one and play at all other Sandals Resorts in Jamaica. Since 3 of our resorts are in the Montego Bay area within minutes of each other, free roundtrip transfers are provided throughout the day, giving you the freedom to choose from as many as 18 different restaurants, plus expand other amenity choices as well from pools to bars. It's like having multiple vacations in one! Service, Full Bath, Roman Tub Baths (some suites), Telephones in Bed Rooms; Special equipment for the Physical Challenged available. Top-of-the-line equipment for scuba diving is included; however, you're welcome to bring your own. You must remember your diver certification cards to enjoy full diving privileges. If you have any contra-indications to diving you must have a doctor complete and sign the physician section on the medical questionnaire form before you will be allowed to dive at any of our resorts. Tips and gratuities are strictly prohibited for all staff except personal butlers and Spa Therapists. In the event you wish to tip your Butler or Spa Therapist, it will be greatly appreciated but under no circumstance will a tip be required or solicited. As the leader in destination weddings, Sandals ensures your wedding will be as special as your love for each other. Now, in an industry first, Sandals has paired with Martha Stewart Weddings to offer six signature wedding themes with true star power. Brides have the option of customizing their wedding experience. Stay 6 nights or longer in any category and the Beautiful Beginnings wedding theme is Free! * Government Administrative fees will apply. *There is an Additional $600 charge for twilight weddings at any resort.